There were a lot of outstanding custom mini figures released in 2012. 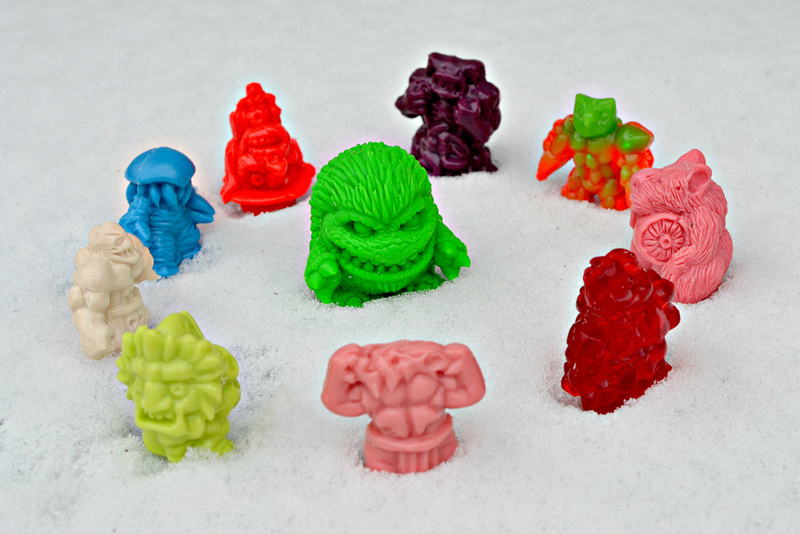 So many that it's hard to pick a favorite, but if somebody held my collection of Neclos Fortress figures over a fire pit and forced me to, I'd probably go with Gorewad Monsters. I first wrote about the Gorewads months ago, when the initial set of three figures was released as a collaboration between Jimmy Rommel (who sculpted them) and Eric Nilla (who handled the molding/casting). Well, thankfully Jimmy and Eric haven't wasted much time in cranking out more of these gross little guys; the second and third Gorewad sets are out now. That's six more miniature gobs of gore to join the gang. Before I talk about the new figures themselves, I have to say I've been a bit surprised that Gorewads seem to be kind of underrated. I consider them some of the raddest mini figures in my collection, but from what I have seen most people seem to be more into Jimmy and Eric's other collaboration, Universe of Violence (which I think also looks pretty awesome, but I can't afford to collect both and Gorewads appeal to me a bit more). I just think everything about the Gorewads is really cool, from how mini they are (around 1") to the fun gross-out humor of the sculpts to the superball-ish rubbery material they're made of. I also love the variety of colors they're being cast in; waiting to see which colors will arrive in the mail makes them even more fun to collect. 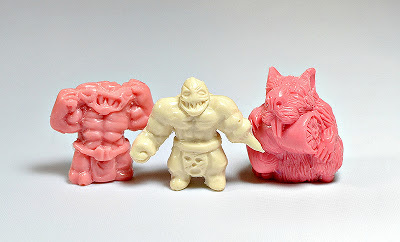 Set two consists of a hamster eating a finger, a monster that looks like it's tearing its own face off and warrior monster with a spike for a hand (which I think is a "mini me" version of one of the Universe of Violence figures). Uh, did I mention there was a hamster eating a finger!? I love it! (although it kind of brings back crazy memories because I used to have a hamster that would try to bite my fingers off whenever I put my hand into his cage--seriously...the thing was evil). I really like the sculpts of the other two guys, too, although spike-hand marks the first Gorewad that's not particularly gory; it seems to break away a bit from the original intention of the line, but I personally don't mind the added variety. He's monstrous enough that he doesn't seem out of place. My set two arrived in M.U.S.C.L.E.-esque pink (face-tearing guy and finger-gnawing hamster) and creamy white (Universe of Violence guy). 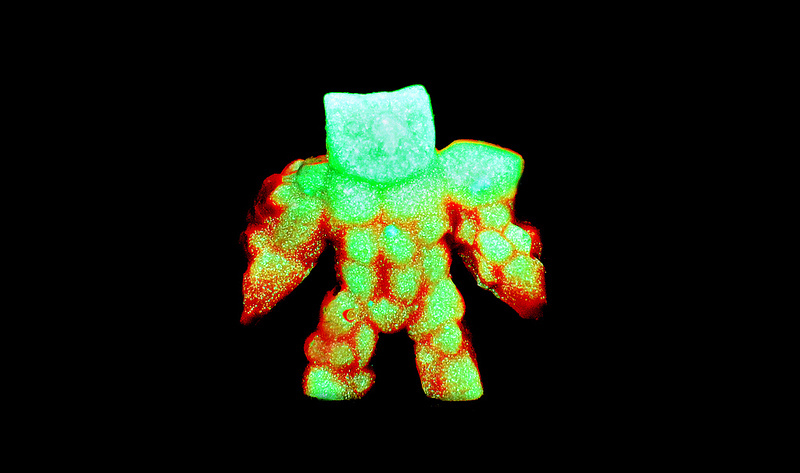 I especially like how well the pink shows off the impressive details that have been sculpted into these very mini figures. Of the two new sets, I think set three is my favorite. As with the blood-thirsty hamster in set two, set three has one figure that stands out as the goriest--a demented, hat-wearing severed head. But not just any demented, hat-wearing severed head--one that has a tiny creature crawling out of it! As with the face on the back of "Diet Hell Turtle's" shell in set one of the Gorewads, it's a detail that kind of catches you by surprise--another thing that makes me such a fan of this line. I don't know if he has an official name, but I call him "Dread Head." And mine came in bright red, which I think is the perfect color for this sculpt. The other two characters in the group, like set two's spike-hand dude, veer away from the goriness. Instead they're just cool-looking little creatures. 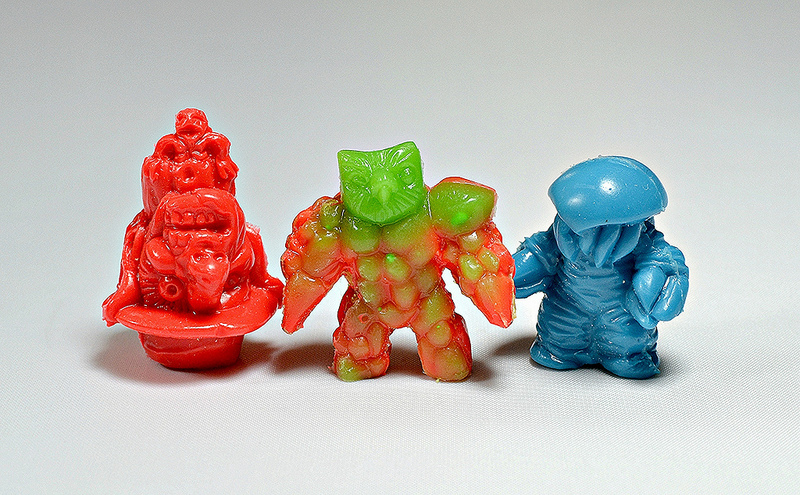 One of them, a little mollusk-alien dude (which I got in blue), is one of my favorite Gorewads so far. He's actually kind of, uh...cute (seems strange to say that about something called a Gorewad Monster, but come on, you've got to admit...). The final guy looks like some sort of owl warrior monster; I really like the bumpy texture of this sculpt, and what makes it even cooler is that mine came cast in two-tone, glow-in-the-dark rubber. Awesome. 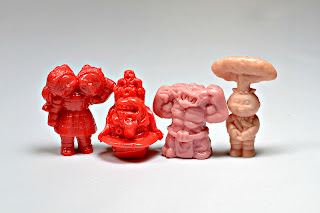 The only small criticism I can think of about the six new figures is that the general feel of some of the sculpts seem a bit removed from those of the first three figures. While the three set one figures all had a sort of globby, wad-ish quality (haha, "wad-ish") which really connected strongly to the name of the line, some of the new sculpts start to move away from that (most noticeably the spike-hand and owl monster warriors). I can't say this really takes away from my overall enjoyment of the line--it's just an observation I had when looking at all of the figures together. You can pick up all sets of the Gorewads at Eric Nilla's online store.